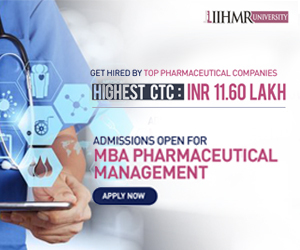 Bhupal Nobles’ College of Pharmacy, Udaipur, Rajasthan, INDIA. 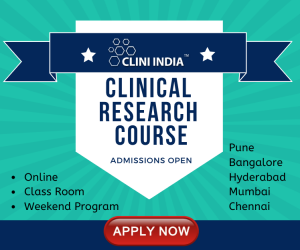 Recent studies reported approval of lipid vesicles as drug carriers for chemotherapeutic agents and bio-actives which have been revealed in a number of lipid vesicles based formulations, which are commercially available or are currently undergoing clinical trials. This review is mainly focused on effectiveness and permeation enhancing controversy of lipid vesicles as dermal and transdermal drug delivery with special emphasis on recent advances in this field, including the development of deformable vesicles, ethosomes and invasomes. Only specially designed lipid vesicles have been shown to be capable of achieving enhanced delivery. The incorporation of additives, such as anionic surfactants and ethanol, fluidize the phospholipid bilayers, thus can penetrate the intercellular pathways of the skin. During the past decades there has been wide interest in exploring innovative techniques to increase drug absorption through skin [1, 2]. The skin covers a total surface area of approximately 1.8 m2 and provides the contact between the human body and its external environment. Transdermal drug delivery uses the skin as an alternative route for the delivery of local and systemically acting drugs. This drug delivery route have several advantages compared to oral drug administration. The variables that could influence gastro-intestinal absorption such as pH, food intake, gastro-intestinal motility, the hepatic metabolism leads to the variations in drug plasma levels. Drugs particularly of a narrow therapeutic window can be delivered through skin with reduced the side effects. The barrier nature of skin makes it difficult for most drugs to penetrate and permeate through it [3-5]. The earliest report of liposomes effectiveness for skin delivery was published by Mezei and Gulasekharam(1980), conflicting results continued to be published concerning their effectiveness, enhancing the controversy of liposomes as dermal and transdermal drug delivery vehicles . Classic lipid vesicular systems are of little value as carriers for drug delivery via the skin because they do not penetrate it deeply, but rather remain confined to upper layers of the stratum corneum. Only specially designed liposomes have been shown to be capable of achieving enhanced delivery. The incorporation of additives, such as anionic surfactants and ethanol, can fluidize the phospholipid bilayers, thus increasing the depths to which liposomes can penetrate the intercellular pathways of the skin. Also, liposomes that have been conjugated with PEG or antibodies can increase the residence time of anticancer drugs in the circulation and enhance drug accumulation in tumors. A new class of lipid vesicles is the highly deformable (elastic or ultra flexible) liposomes, which have been termed Transfersomes. Recent studies have reported that deformable liposomes were able to improve in vitro skin delivery of various drugs. Ethosome is another novel lipid carrier, recently developed by Touitou et al., showing enhanced skin delivery [7-10]. The aim of present article is to provide an overview of modified lipid vesicles as carriers for skin delivery of drugs, with special emphasis on recent advances, including the development of deformable liposomes, ethosomes and invasomes. Liposomes have been extensively investigated as potential drug delivery systems due to the enormous diversity of structure and composition that can be achieved . 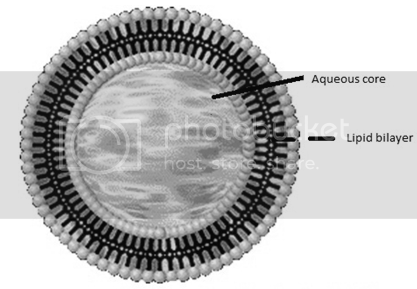 Liposomes are broadly defined as lipid bilayers surrounding an aqueous space (Fig.1). Multilamellar vesicles consist of several (up to 14) lipid layers (in an onion-like arrangement) separated from one another by a layer of aqueous solution. These vesicles are over several hundred nanometers in diameter. Small unilamellar vesicles are surrounded by a single lipid layer and are 25–50 nm (according to some authors up to 100 nm) in diameter. Large unilamellar vesicles are, in fact, a very heterogeneous group of vesicles that, like the Small Unilamellar Vesicles, are surrounded by a single lipid layer. The diameter of these liposomes is very broad, from 100 nm up to cell size (giant vesicles) . The potential value of liposomes for topical therapy was first introduced by Mezei and Gulasekharam (1980). In this study, greater four- to five-fold triamcinolone acetonide concentrations in the epidermis and dermis, with lower systemic drug levels, were observed when the drug was delivered from liposomal lotion in comparison with conventional formulations of the same drug concentration. An important role of the transappendageal route in improving skin delivery of drugs by liposomes was also suggested. Recent studies suggested that the role of the transappendageal route is limited to improved vesicular penetration into (i.e. targeting) but not necessarily through hair follicles and that it plays no major role in improving liposomal transdermal delivery. Furthermore, the composition of the vesicles influences their physico-chemical characteristics such as, size, charge, thermodynamic phase, lamellarity and bilayer elasticity. These physico-chemical characteristics have a significant effect on the behavior of the vesicles and hence on their effectiveness as a drug delivery system. An enhancement of liposomal entrapment and simultaneously a decrease of vesicle diameter were observed [13-16]. Several in vivo and in vitro transport studies reported that conventional liposomes only enhanced skin deposition, with mostly reduction (or no effect) in percutaneous permeation or systemic absorption, Phospholipids are able to diffuse into the subcutaneous (SC), and the interactions and enhancer effects of liposomes on the SC are based on the lipid mixing of liposomal phospholipids with lipid bilayers of the skin . Phospholipids in liposomal systems can disrupt the bilayer fluidity in the SC, decreasing the barrier properties of the skin. Moreover, some investigators report that phospholipids in liposomes may mix with the SC lipids creating a lipid-enriched environment . This lipid depot in the skin is preferred by lipophilic drugs, resulting in enhanced skin uptake. In some cases, phospholipids themselves can be the solubilizers to increase the solubility of lipophilic drugs such as indomethacin and miconazole . These results suggested that conventional liposomes were useful for topical dermal delivery of these drugs. Several recent studies suggested other applications and confirmed improved skin deposition [20-23]. The extent of interaction between lipid vesicles and skin was highly dependent on the lipid composition of the liposomes, confocal microscopy studies showed that intact liposomes were not able to penetrate into granular layers of the epidermis . Liposomes should exhibit their enhancing effect on skin in the presence of organic solvents such as propylene glycol, tetraglycol and ethanol. The concentration of phospholipids and the presence of unsaturated fatty acids in phospholipids are also important factors affecting transdermal flux of drugs [25- 27]. The rationale for using vesicles in dermal and transdermal drug delivery is many folds. 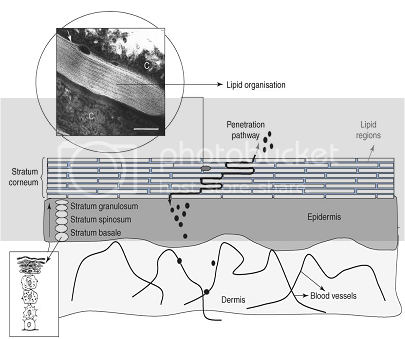 Vesicles might: (a) act as drug carriers to deliver entrapped drug molecules into or across the skin;(b) act as penetration enhancers owing the penetration of the individual lipid components into the stratum corneum and subsequently the alteration of the intercellular lipid lamellae within this skin layer; (c) serve as a depot for sustained release of dermally active compounds;(d) serve as a rate-limiting membrane barrier for the modulation of systemic absorption, hence providing a controlled transdermal delivery system. To obtain a sound understanding of the mechanism of the action of vesicles and to select the most appropriate drug compounds to be delivered by vesicles (Fig2.). If vesicles act as carrier systems, they might be able to transport large molecular weight drugs, such as proteins into the skin or even into the systemic circulation. If they act as penetration enhancers, however, the main mode of action is a perturbation of the lipid organization in the stratum corneum, thereby increasing the transport rate across the skin. The latter is only efficient for low molecular weight drugs. One of the most important characteristics of drug carrier systems is that drug and carrier should permeate along the same route across the skin. In addition the vesicle material profile and the active compound profile in stratum corneum should be very similar . Figure 2. A schematic drawing of a skin cross-section . The skin is composed of a dermis and an epidermis. In the basal layer of the epidermis cells proliferate. Upon leaving the basal layer cells start to differentiate and migrate in the direction of the skin surface. At the interface between stratum granulosum–stratum corneum final differentiation occurs, during which the viable cells are transformed into dead keratin filled cells (corneocytes). The corneocytes are embedded in lipid lamellar regions. Substances permeate mainly along the tortuous pathway in the intercellular lamellar regions. The thickness of the stratum corneum is approximately 15 mm. C = corneocyte filled with keratin. Bar = 100 nm.